Here is about Fred's journey on Voyage 1 for the Aurora Australis of 2013 departing Macquarie Wharf 2, Hobart on the 15th October and arriving at the Australian Station, Davis Station, Antarctica on the 5th November. 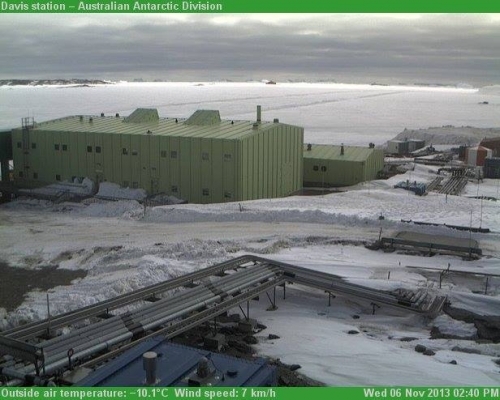 Julie Janseens passed over Fred to me on the 15th October prior to departing on the Aurora Australis for Antarctica. There was quite a leaving party for Fred and myself with a lot of my friends and family seeing me off on my journey to Antarctic where I will be staying for the next 12 months. Fred immediately made a new friend and companion for the journey, Jem who is a wombat that was a leaving gift from three of my close friends in Hobart (Julie, Eva, Mana therefore Jem). Once we were on the Aurora we were given a tour of the vessel, inducted into a number of the safety procedures on board and briefed on the journey ahead. Unfortunately during the briefing we were informed that there were quite large storm systems throughout our path through the Southern Ocean so for the first 3-4 days it would be quite rough seas and following this the sea-ice off Davis Station was the thickest on record. So we prepared for a long and rough journey! For the first 3-4 days the captain steered the ship pretty much due south till around 60 degrees to avoid the two large storm systems that lay to the west on the route to Davis. This was quite successful but although we avoided both storm systems we still had quite rough weather for 4-5 days. Unfortunately I didn't cope with these seas very well and spent most of the first week "lying low" in bed ... so Fred didn't get to see much of the ship or anything else. A week in we reached the sea-ice and everything became a lot calmer! I was finally able to get out of bed and life of the ship consisted of eating (the food on the Aurora is amazing), playing lots of cards, watching movies and taking photos. However we then found very quickly that the ice as predicted was incredibly thick and the ship struggled to break through a lot of it. Often we would spend hours at a time to move 100m. However finally after 3 different route attempts through the ice, with the help of the helicopters that were on board to be delivered to Davis Station as well as the Bassler (small plane) that was at Davis waiting to transfer expeditioners to Mawson Station which were on the ship, we finally found a route through to Davis. However due to the thick ice we arrived over 1 week late on station. On the trip down there were a mixture of days; some stormy, rainy, rough, windy days at sea due to the storms, followed by beautiful sunny, calm days when we were hit the ice, a number of days of intense low cloud and high winds (making everything incredibly white such that your couldn't tell the sky from the ice and the ice-bergs from the sea-ice) and then some lovely fine sunny days on the last week before arriving on station allowing us to spend a lot of time out on the decks of the ship. We were lucky enough to see plenty of penguins (both Adelie Penguins and Emperor Penguins), seals (mostly Crabeater seals and a couple of Weddell Seals), plenty of seabirds (Giant Petrels, Snow Petrels, Cape Petrels and Antarctic Petrels) and some people (unfortunately not me) were lucky enough to see some whales. The reactions of the different animals was amazing to see. The seabirds lovely using the airflow around the ship to glide in and then when we were breaking ice they would feed off the bottom of the ice we had stirred up behind us, feeding on the krill and algae on the bottom. The Adelie Penguins would tend to run madly around when they saw the ship, meanwhile the Emperor Penguins would just stand and watching (I think they were thinking "What are they doing?!?!"). The seals would have various different reactions including just watching, running around, running towards the ship etc. 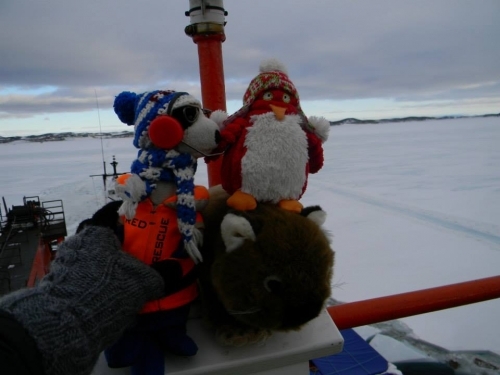 During the journey Fred met plenty of people including Jem, a penguin belong to Sarah, our cabin mates Kerryn and Layla as well as a a number of the other 115 people that were onboard the vessel. It was great to see people interest in Fred's adventures. He is now lucky enough to be looked after by Kate one of the expeditioners who isn't staying at Davis but returning on the ship back to Hobart. Hopefully they have a smoother, quicker voyage home!